We now turn our attention to the two peaks ofFig. 41-14, labeled K” and K/3′ These (and other peaks that appear at wavelengths beyond the wavelength range displayed inform the characteristic x-ray spectrum of the target material. The peaks arise in a two-part process. (I) An energetic electron strikes an atom in the target and, while it is being scattered, the incident electron knocks out one of the atom’s deep-lying (low n value) electrons. If the deep-lying electron is in the shell defined by n = 1 (called, for historical reasons, the K shell), there remains a vacancy, or hole.. in this shell. (2) An electron in one of the shells with a higher eergy jumps to the K shell, filling the hole in this shell. 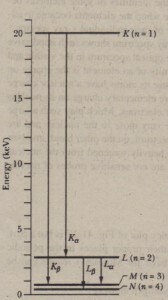 During this jump, the atom emits a characteristic x-ray photon. If the electron that fills the K-shell vacancy jumps from the shell with n = 2 (called the L shell), the emitted radiation is the K” line ofFig. 41-14; if it jumps from the shell with n = 3 (called the M shell), it produces the Kp line, and so on. The hole left in either the L or M shell will be filled by an electron from still farther out in the atom. In studyingx rays, it is more convenient to keep track of the hole created deep in the atom’s “electron cloud” than to record the changes in the quantum state of the electrons that jump to fill that hole. does exactly that; it is an energy level diagram for molybdenum, the element to which Fig. 41-14 refers. The baseline (E :: 0) represents. the neutral atom in its ground state. ‘Die level marked K <at E = 20 keY) represents the energy of the molybdenum atom with a hole in its K shell. Similarly, the level marked L (at E = 2.7 keY) represents the atom with a hole in its L shell, and so on. The transitions marked K” and K/3 in Fig. 41-16 are the ones that produce the two x-ray peaksin . 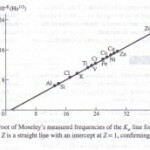 The K” spectral line, for example, originates when .an electron from the L shell fills a hole in the K shell.In , this jump corresponds to a downward transition of the hole, from the K level to the L level. characteristics rays of that element.